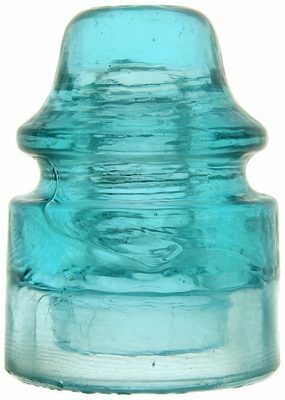 Lot 90: CD 157.5 STANDARD GLASS INSULATOR CO. Color: Light Blue Description: 1" bruise on the base, otherwise easily grades very near mint. No glass is missing and the base embossing can be clearly read. For accuracy, it has a very light haze that tends to disappear when backlit. This signal style was most likely used on fire alarm systems near Boston in the 1890's. These are becoming harder to find, so don't miss this chance!